Olive oil bread, kaaek bel zait (كعك بزيت) or akras el eid (اقراص العيد) is a popular bread in the middle east.It is usually made in the olive pressing season to celebrate the fresh olive oil and a sweetened version of it is made in Eid as a dessert served to friends and family. 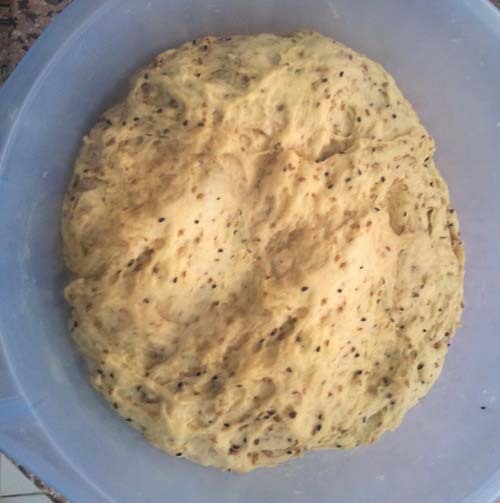 What makes this bread special is the combination of seeds (sesame, Nigella and anise seeds), spices (mahlab, ground anise and ground fennel) and olive oil. The seeds add texture and little bursts of flavor when you bite into them. While the olive oil adds a nutty rich flavor and a beautiful yellowish hue. The characteristic pattern that sets this bread apart comes from the hand carved wooden molds traditionally used in making this bread. 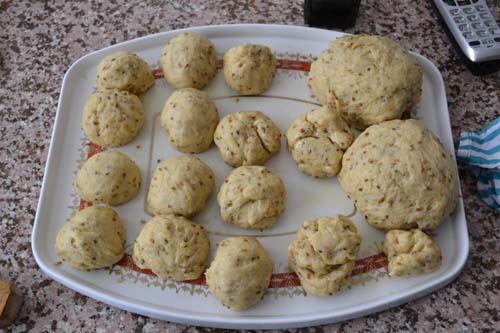 If the mold looks familiar, it is because the mold is a bigger version of the maamoul molds you saw in my maamoul post. As with the maamoul molds, these beautiful old hand carved molds are being replaced by plastic mass-produced ones. They may be cheaper and easier to find than their wooden counter parts but if you ask me, they lack the character and spirit unique to the hand carved ones. 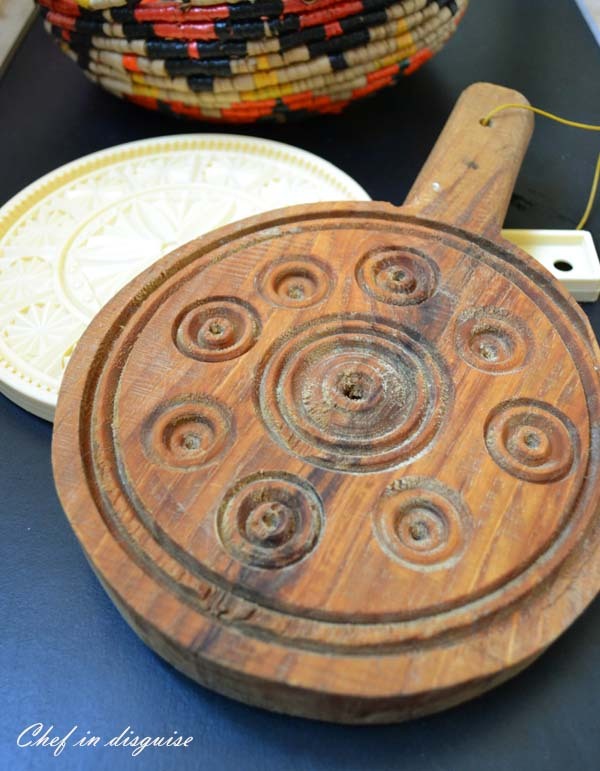 There are different stories behind the patterns on the old traditional wooden mold. My favorite is that the little circles are supposed to resemble the effect raindrops leave when they hit the soil or water. Being originally a peasant bread, farmers wanted bread with patterns that reminds them of the rain that means a good season. Making this bread is easy and rewarding. The combination of seeds and spices used to season it, with the nutty olive oil results in a unique bread that will captivate your senses. It is beautifully patterned with a special warm and earthy hue. When you bake it, a cloud of spice will take over your house and call everyone to the kitchen. The real treat however is when you taste it. Soft and chewy. Fragrant with pleasant hints of spice. Rich without being overwhelming. If you need any more convincing and you are not already in the kitchen gathering ingredients, this olive oil bread stays in the fridge in great condition for 2 weeks and you can store in the freezer for 3 months. All you have to do is take it out and heat it, make a cup of tea and enjoy a wonderful snack or lunch with some salty cheese and sliced cucumbers and tomatoes. Proof the yeast by mixing the yeast with 1/2 cup of water and the sugar and wait for it to foam and bubble. 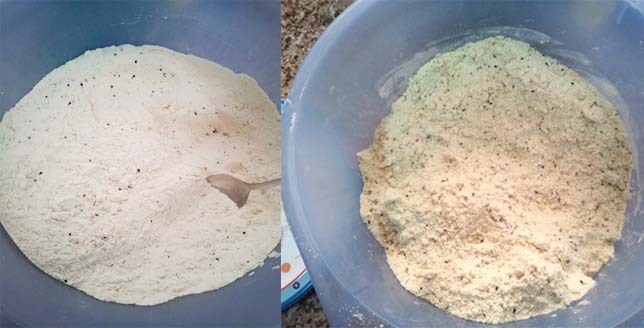 Add the olive oil and rub it into the flour mix with your finger tips until the mix resembles wet sand. Add the yeast water mix and start kneading the dough. Cool the bread on a wire rack and then store in the fridge for 10 days or freeze for up to 3 months. Serve with a salty cheese like nabulsi cheese and a cup of tea and enjoy. 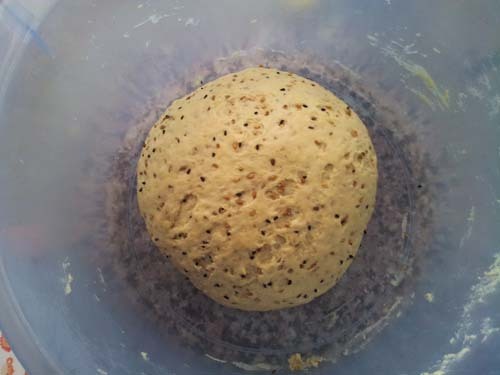 Wait or bake immediately: Another way to control how soft or crisp your bread will be. If you want the bread to be soft and chewy allow the bread to rest for 15-20 minutes after rolling. If you want it to be crisper, bake it immediately after you roll it. Posted in Bread and pastry. Bookmark the permalink. Ooohhhh…Sawsan…I’ve never had these before. The molds are so very lovely–and you are right, they have real character. This recipe, even without the molds, is in my “to make” file! Thank you. What a beautiful production! I can almost smell the seeds and the olive oil in this bread – just perfect! Looks delicious! I can eat through the screen if I could. Saving this recipe to make for Eid but not sure if I can wait that long. Also, love the make ahead part. In the absence of the mold what can I use to make the pretty designs? The small loaves in the picture on the top seem thicker compared to the rest. Were they not made using the mold? Yes the ones on top where not made with the mold. They where just rolled by hand. This bread sounds delicious, and the molds are beautiful! I have never saw one of these larger molds here in Saudi. Do you know where I can buy one from I would love to buy it and make this inshAllah. It looks amazing. Oh my golly gosh, this is the first time since going grain-free, that I have hungered after some bread. That looks truly delicious. So many great things about this recipe Sawsan – the seed combo, the colour and the fact that it stays fresh for so long. Looks delicious. Lovely photos too as always! Oh Sawsan, these look absolutely delectable! I will HAVE to try them! Your photos are always so homey and beautiful! Wow, these look wonderful Sawsan, and you know I just WANT that mold. What a beautiful bread it makes, and I really love how versatile this recipe is, thin cracker, thick chewy bread, what more can you want? I love the flavour of olive oil in bread too and I still have some that I brought back from Morocco (it’s very olive tasting). I may have to go on the search for these beautiful molds, out of wood, of course. Hope you survived your snow storm, all of our snow melted last week with a warm front — it was nice to be able to open the windows (12°C), but now it’s winter again and it’s darn cold. My hands and feet have been cold all week. This bread would really make the house smell amazing. I love those molds! Wood for me, please. And I love the recipe, too. What great flavor! Really looks like fun both to make and eat. Thanks for this. This bread looks so very wonderful. The molds give such an elegant presentation! This bread looks amazing!! I like these flatter breads instead of the traditional american loafs of bread. There needs to be a love button up there! I was at the Bazaar of the old town in Damascus one week ago, have seen those molds. But, who would go to Damascus right now? 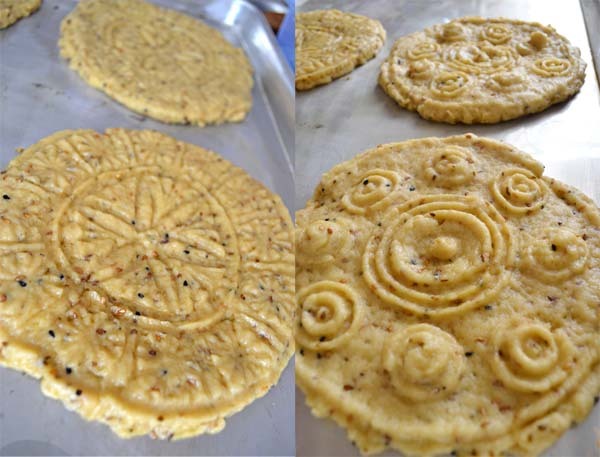 I am going to try this but with whole wheat flour… Thank you for all the awesome recipes you share with us Sawsan. the bread sounds lovely Sawsan.. I love the taste of olive oil in bread.. its fresh and distinctive.. and am a big fan of sesame and all those spices.. except for maybe mahleb..i should have the rest.. it all sounds so good!!! Beautiful post, beautiful bread. I wanted to jump up and run to the kitchen and start them immediately, but it’s almost midnight here so I will have to wait. (But only until tomorrow.) And I happen to have mahleb and black sesame seeds left over from some khak I tried to make a while ago (which came out only so-so). For the smaller ones on top made without the mold, it looks like you coiled them and then flattened them, no? Does that give them a layered texture? Oh yes, I will be making these soon. Thanks so much. So sorry for the delay Channa. The smaller ones on the top were made by simply rolling out the dough. No coiling. 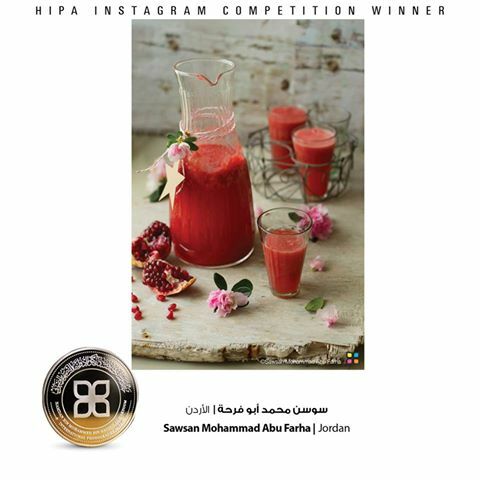 Sawsan, this sounds so good and looks so lovely! I agree with you; older, wooden molds have character. And thank you for showing us the names in Arabic; I find the writing to be the most beautiful in the world…it’s art to me! I love the meaning behind the molds–that the farmers wanted to be reminded of rain, which is essential to a bountiful harvest. Lovely! I agree that it is a shame they are moving to mass-produced plastic molds. They definitely lack the character and charm of the wooden versions. I bought my ma’amoul molds at a shop down the street. I will have to see if they have these too! What a treasure to have a mold handed down from your mother. Bet you think of her every time you use the mold. Hand carved wooden molds are so rare these days. Your bread sounds real yummy. What a beautiful bread, the molds leave such lovely patterns! I know I would love that bread. I’m a breadaholic anyway, but this sounds special. And I definitely want your wooden molds! This is SO up my alley, Sawsan! I would love (love!) to make it! Several of these spices (or seeds) I’m not familiar with but I think I need to make an Internet shopping trip to my spice source. Love everything about this bread, from it’s history, it’s appearance, it’s seediness (in the right sense of the word!) , the press it’s made with and its heavy olive oil note! I really think I Need to make this beautiful bread! I wonder if I can locate a press?? Actually I’ve only never heard of the mahlab, but the nigella seed I’ve heard of but to the best of my knowledge never tasted. Oh wow! I have never heard of this bread before, but it looks and sounds delicious! The molds are so lovely and full of character! They are very special! I would love to sample these one day! These little breads look scrumptious :). Thank you for another wonderful recipe. Hi Sawsan, love your bread, very interesting. This is the first time I see this kind of bread and the mold. Very unique and beautiful. Excellent posting. Your bread looks absolutely delicious, and pretty, too! LOVE this recipe. Are the whole spices set in stone (traditionally) or can other spices be used, like cumin or fennel or cracked coriander? So sorry for the delay Laura. This little breads look delicious! I love your beautiful mold but glad to know that you really don’t need it. Olive add such a fabulous flavor to breads. I can’t wait to make this! Sawsan, this is definitely something I’ll be trying when we press our olive oil this year! My husband’s family has a ritual olive picking and pressing each Autumn, so in May this year when the time rolls around, I’ll be waiting with flour in hand to make this beautiful kaak. In the meantime I need to ask one of my cousins in Amman to see if she can find me a mold! Or, troll the Palestinian/Lebanese shops to see if they have one 🙂 Beautiful recipe. I love all your wooden molds Sawsan. They are so beautiful. This bread sounds delicious. I made a bread with anise in it once and loved it (Not sure why I haven’t made it since. ), so I know I would really enjoy these. I think Miss A would really like it too. I can almost smell it! How wonderful they looked, Sawsan! It’s impossible to find that wooden carved mould here ( I have added that to my shopping list now, whenever I come to your side of the world! ),I can just imagine the aroma of spices and olive oil in the bread. Maybe I would just hand knead it? They look really irresistable. I have never seen or heard about this bread. looks great. The mold is so interesting too,how i wish i had one. My Sister in law lives in the middle east i think i should ask her to pick one for me:) I also havent heard about nabulsi cheese,i went through your link. I will buy rennet and make this soon. great recipe Sawsun:) loving it! I have just one word for this: WOW!!! Can I visit you? Can I Can I Can I?????? I want to eat everything you cook. Seriously!!! The molds are lovely, beautiful….! Be sure to find something! I have a question, don’t you add salt to the recipe? I just baked them yesterday, but I found that some salt was missing. I checked your recipe again and I didn’t see it in the list. My mom makes this bread every Eid and I love it!! I eat it with either halloumi or akawi cheese and dip it in olive oil, love love! I’ve never actually made it myself though. I have a question though, I don’t buy powdered milk, could this be substituted with real milk?? And how? Thanks! Awesome! How much sugar can I add to the recipe to make it sweet? Hello Kamela. I have never made a sweet version of this bread. It depends on how sweet you want it to be. I have noticed that you do not add salt. It is only the 2 spoons of sugar? Thank you so much for the links Celia! Tempering chocolate has been on my list forever! You inspired me! Do you know I have the exact same mold you used in the chocolate treasure chest! I am going to ask a silly question, do you line the molds with anything before pouring the chocolate to make it easier to remove the chocolate from the moulds? Not a silly question, and no, nothing at all. If the chocolate is in temper, it should release cleanly from the moulds with a firm tap. I’ll check out your maamoul shortbreads, thank you! Just found your blog and I love it. Can’t wait to try this beautiful bread. I can’t wait to try this bread, it looks delicious! 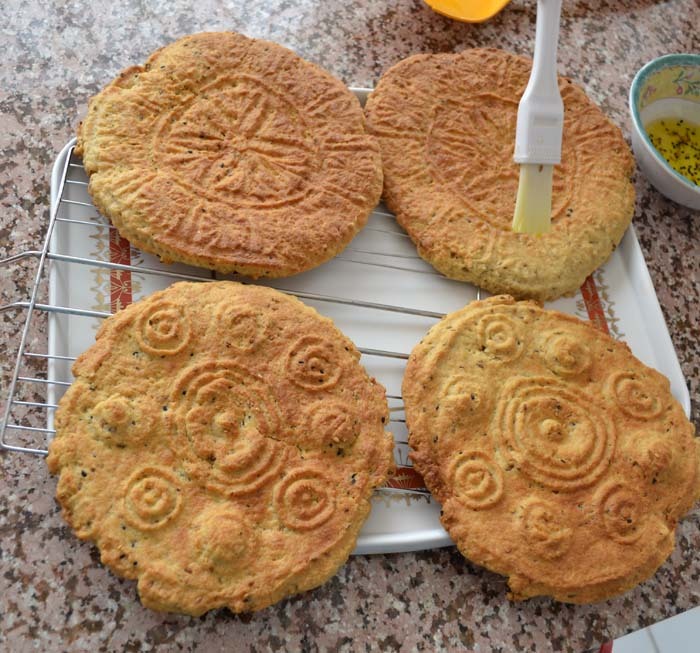 My husband is from Palestine and he likes this bread a lot every time my mother in law bakes it when they visit us. I will surprise my hubby when I make this. I’m so happy I found your website. I tried your Makloubeh recipe and my husband and kids love it! Shukran ya habibti! 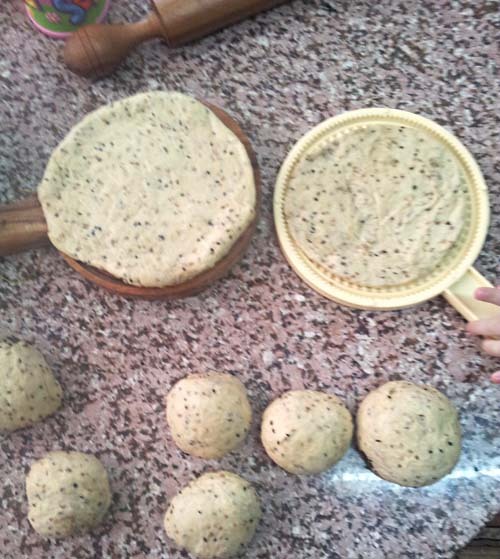 Thank you Sawsan, the bread is beautiful and full of original Palestinian flavor… and the smell of baking is just great …. Thanks once more of the accurate recipe… all the best..
Hi there, I really love your recipes, they skyways inspire me to do more baking and to be mire adventurous. I’d very much like to make this bread and wondered if you would be able to kindly source one or two if these bread molds for me, I would be very happy to pay fit theses lovely items. In the UK I can’t seem to find them anywhere or even online is proving to be very difficult. Any help would be greatly appreciated. Assalamalaikum. I’m so glad I accidentally stumbled on to your blog just a few days back. I’m browsing through your recipes and that keeps me awake at night. I have a question, many of your recipes include anise seed is that the same as yansoon? If I can not find anise seed what can I use as a substitute in the above recipe. Thank you! Hi Sawsan, I just made this bread for dinner tonight. We ate it with your “orange” lentil soup, it was absolutely scrumptious. Thank you so much for this and all of your delicious recipes. Tried it and it’s so good! looking forward to try more recipes from your blog thanks! What wonderful-looking bread – with some of my favorite flavors. I’ll be spending today in your virtual kitchen between these and the cheese/zaatar breadsticks. But I have a question: is it necessary to use powdered milk, or can I substitute milk for the dried milk and water? Maybe in different amounts because I know a half cup of dried milk is supposed to be equivalent to 1 and half cups of liquid milk. Could I use a cup and a half of milk, ½ cup of dry milk, and half a cup of water? If you have dry milk then use the amount in the recipe because it helps with the bread color,texture and taste. If you don’t have dry milk then omit it and replace the water in the recipe with liquid milk. The resultibg bread is better with powdered milk but it is still pretty good if you use liquid milk. Thank you. I tried it with a mix of dried and liquid milk, and it was excellent. I’ll do all-dried next time. Also, does the water for the yeast count as part of the 2 cups of water? 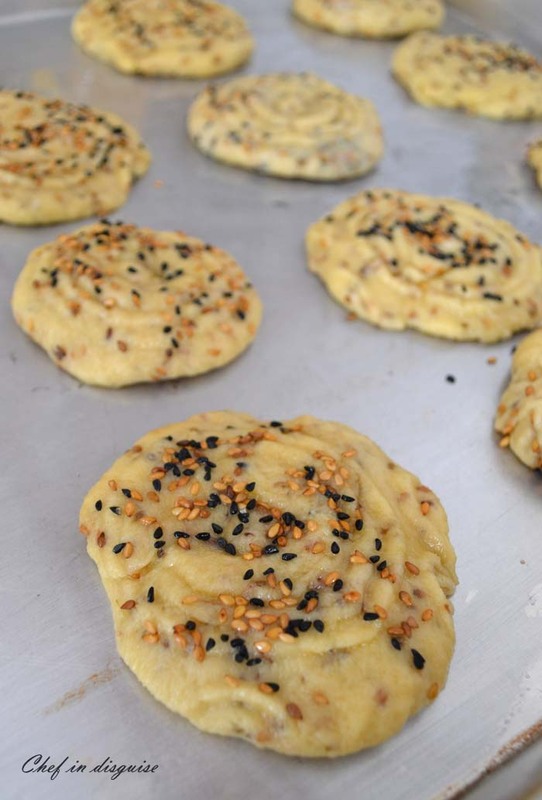 we love kaaek bel zait,second us it is certainly the most delicious biscuit on the world. !